The Watson's Leaping Bonito is a sub-tropical fish frequents coastal waters of mid to northern east coast of Australia. More abundant in Queensland where schools swim inshore to feed on small baitfish. It is different from the common Bonito by having a combination of spots and broken bars above the lateral line and continuous longitudinal lines below. The dorsal fin is black in front and pearly white behind and is decidedly taller than in the bonito. They are often caught among common Bonito, and may go unobserved until the difference is pointed out. They are excellent baits for Marlin. The Leaping Bonito is known to frequent estuaries in search of bait fish populations during the winter months. 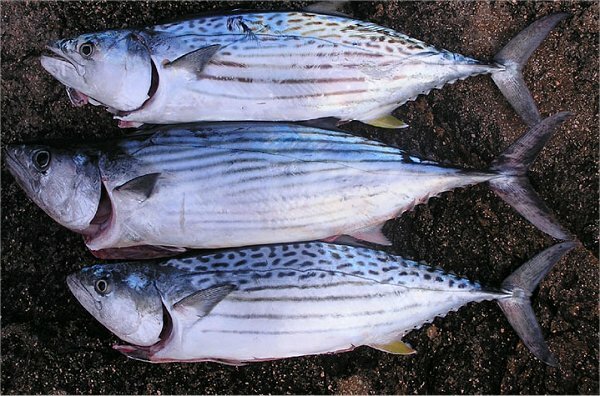 How to distinguish a leaping bonito from mackerel tuna: back is covered with elongated small spots, belly is striped. Taste, Texture Strong taste, firm texture. Usually sold whole, though fishmongers will fillet it upon request; also sometimes available as sashimi. In whole fish look for lustrous skin, firm flesh, and a pleasant, fresh sea smell; flesh should be pale reddish (pale pink to white in Leaping Bonito), firm, lustrous and moist without any dull brown markings or oozing water. Always buy sashimi-grade fish if it is to be served raw or rare. Pan-fry, bake, grill, barbecue, smoke, raw (sashimi), pickle. Australian Bonito is fully fished in Australia. It is a relatively fast growing species that supports seasonally significant commercial and recreational catches. Recent research has shown that Australian bonito are fast growing fish which can grow to nearly 40 cm fork length (FL) in one year and the majority of fish in landings are less than 3 years of age. Australian bonito grow to a maximum length of about 80 cm and a weight of 9kg, but the majority of fish in landings are 30 to 60 cm in length and less than 2 kg in weight. Line methods within the Ocean Trap and Line Fishery account for the majority of the catch. More links to pages with information about Watson's Leaping Bonito and Bonito, Tuna recipes from Sea-Ex and HowToCook Fish.info, exporters, importers, processors and wholesale suppliers of Bonito from Trade-Seafood.com. Australian Government Bureau of Agricultural and Resource Economics Australian Fisheries Statistics.